After 12 ? years of blogging on-and-off in my free time while working in the Industry, I finally decided to take it a step further and try to get a bit more involved with my followers. I decided to relaunch and rebrand my website and incorporate my two blogs into one site on a platform where I have more control over the content. One of the tools that will be available to me (finally) is a newsletter where I can communicate what is going on, let my followers know when new blog posts and tutorials and other exciting content is posted. It will also be helpful when gauging what you would like to see in the future. If you would like to help me and give me little starting off boost, you can already sign up for my Newsletter. That way I can let all my past followers know when the new Weekend Designer site is up and running. Most important though is that I hope you will get to know me and enjoy the topics I post about as I show you how to be your own fashion designer. I hope that I will see you all at the new site on launch day! Proportionate pattern-making is another way to create cutting patterns for various fashion bag designs using their geometric shapes as the basis of the styling. While each pattern template is a different shape, they all share a common measurement or dimension, which more often than not, is its depth or gusset side length. Other times, one can use a known increment of measure from a given detail or embellishment used in the overall styling of the bag. This comes in handy to know if you only have access to limited bag supplies, as you always want to work with what is available to you. Of course this is all so abstract in approach though I like to think of it as being creative; the mathematics behind this concept is solid as a designer is utilizing proportional reasoning and spatial skills to create endless versions of favourite bag styles and shapes that share a common element that they can be put together to form interesting shapes. This means that the areas of the shapes are proportional, a relationship that supports the illustration of various mathematical concepts. Proportionate bag pattern blocks offer a hands-on way to apply foundation grids and the Rule of Thirds, geometry, patterns, ratios, proportions, congruence, similarity, lines of symmetry, and more, in keeping with the basic principles and elements of design, that all designers use whenever they are working on a new collection, whatever may it be. Balance is the concept of visual equilibrium, and relates to our physical sense of balance. It is a reconciliation of opposing forces in a composition that results in visual stability. Most successful bag designers achieve balance in one of two ways: symmetrically or asymmetrically. Balance in a three dimensional object is easy to understand; if balance isn’t achieved, the handbag tips over. To understand balance in a two dimensional composition, we must use our imaginations to carry this three-dimensional analogy forward to the flat surface. This is known as spatial reasoning (see post on developing spatial skills). Symmetrical balance can be described as having equal “weight” on equal sides of a centrally-placed fulcrum or axis. It may also be referred to as formal balance. When the elements are arranged equally on either side of a centerline, such as ‘cutting-on-the-fold’, the pattern is mirrored and the result is Bilateral symmetry. This axis may be horizontal or vertical. It is also possible to build formal balance by arranging elements equally around a central focal point, resulting in radial symmetry. There is a variant of symmetrical balance called approximate symmetry in which equivalent but not identical forms are arranged around the fulcrum line. Asymmetrical balance, also called informal balance, is more complex and difficult to envisage. It involves placement of objects in a way that will allow objects of varying visual weight to balance one another around a fulcrum point. This can be best imagined by envisioning a literal balance scale that can represent the visual “weights” that can be imagined in a two dimensional composition. For example, it is possible to balance a heavy weight with a cluster of lighter weights on equal sides of a bag style; this might be a cluster of small compartments balanced by a large compartment on a backpack. It is also possible to imagine objects of equal weight but different mass (such as a large mass of feathers versus a small mass of jet beads on an evening clutch) on equal sides of a imaginary centerline. Unequal weights can even be balanced by shifting the fulcrum point on our imaginary scale. A ratio is a comparison of two elements. Proportion refers to the relative size and scale of ratios used in a bag design and the issue being the relationship between objects or parts of a whole. This means that it is necessary to discuss proportion in terms of the context or standards used to determine proportions. Also keep in mind, the use of appropriate scale in surface design is also important. For example, an overly large textile design can overwhelm the form and appearance of a small to medium-sized handbag. A surprising aspect of proportion is the way ideal proportions can vary on the human body itself. Styles change in bags as they do in clothing. In the example below, the pattern for this weekender travel bag is a basic rectangular shape and subsequently, sub-divided into smaller parts. In other words, it is boxy with plenty of room to pack a jet-setter’s weekend wardrobe. All bag dimensions relate to each other as all are subjected to the value chosen for ¨X¨. The scale is represented by X. Every time one changes the scale, all the bag’s dimensions change. This contributes to the congruency and similarity in design. Similar bag styles have the same shape, but may be different sizes. For figures to be congruent, the lengths of corresponding sides must have the same ratio. The shapes within the bag pattern are said to be ¨to scale¨ with each other, when all measurements are based upon X (note: there are no seam allowances added to the working pattern, so you will have to true each tracing that is made and add seam allowances). For example if X = 2 inches, which is a good estimate of how wide the struts on this travel bag are, then the dimensions of this particular bag would be 16 inches tall (model height), 18 inches wide (model width), and 8 inches deep (model depth), with a 26-inch zipper opening. As one side of a shape grows, so do all the other sides of that shape. In another scenario, you might have based the value of X on the width of the nylon webbing used in the bag strapping. Nylon webbing is sold in 2-inch width off of continuous rolls in a variety of fashion colours. However, your supplier is sold out and only has the 1-1/2 inch width available. By substituting 1.5 for the value of X, one can keep the relationship between the bag strapping and other bag parts, and also as a whole. In this case, the bag’s dimensions becomes 12 inches high by 13.5 inches wide by 6 inches deep. It is a smaller travel bag in size yet all parts relate with one other, in individual details and collectively as a whole. This method also works for metric measurements. If a change in bag size does not work in your favour yet you want to retain the bag styling, choose a different component of the design to determine the value of X, such as the hardware measurements (inner diameters) or something else which is tangible within your design. Many times I will base the scale of my bag pattern on its finished depth as this particular measurement often reflects what I wish to carry in the bag cavity. In the example above, the depth amount would need to be divisible by 4, as half of a gusset equals 2X. A quarter of my desired bag depth would equal X. The choice is yours to make as you are the designer. The only time this method may not work well is if you want to replicate a favourite handbag, then you must work with the other designer’s measurements instead of your own. However you do have a finished sample in front of you, so all you need do is measure each element with a tape measure and plot out your pattern-draft. In spatial reasoning, using such visual clues is much like using a ruler. What are the dimensions of the bag? What are the sizes of the bag details? There is no right nor wrong answer as long as all parts relate to one another. In the example given, the assumption is that the strip of material that make up the bag strut is approximately 2 inches wide. You can then visualize how many times you can ‘fit’ the strut piece into the height of the bag or the base of the bag or the exterior pocket and so forth. Partitioned elements can now be traced off the main pattern such as the zipper facing, exterior pocket, and the handle struts. It is very accommodating. As designers, we value this harmony in our creations. It is the difference between a professionally-designed bag and a homemade one. Fashion purses and bags come in all sorts of sizes and shapes. The permutations are endless, but they have one thing in common. They begin in the form of a simple geometric shape, usually a derivative of a rectangle, square, circle, or cylinder. When you manipulate this shape by slashing and spreading, then adding gussets and darts, the magic begins. There are no reasons why anyone cannot draft their own patterns to make uniquely custom bag designs. 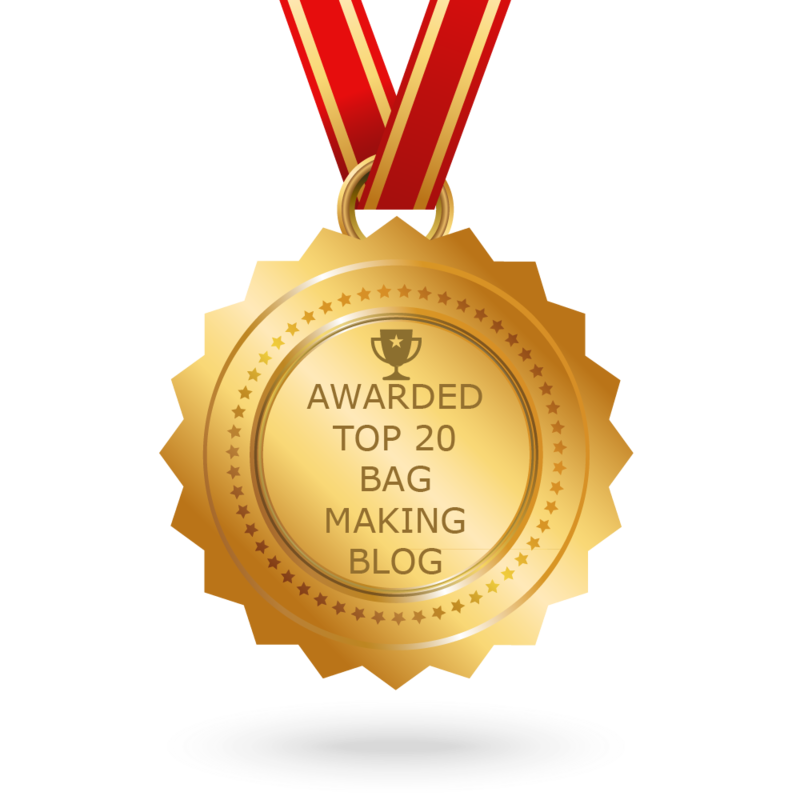 You only need to understand the various bag shapes, know how a bag is put together, and have the proper pattern-making tools and supplies on hand to get the job done. Once you are familiar with the basics, you will be able to analyze any style of bag and expand on and embellish it to suit your vision. The materials that your bag is made from can make or break its style and panache. Many newbies to bag design are intimidated by working with novel materials such as leather and plastics, but it is actually very simple to handle if you follow a few guidelines. The thought of painting leather edges may be daunting, but it’s a straightforward process when you are equipped with the right tools and have a comfortable, properly set up workspace. If you are just starting on your handbag-making journey, read through this post and gain an understanding of the basics and make sure you have a few essential tools to draft your patterns. If you already have experience and the necessary equipment, go ahead and pick a bag style and start creating. When you take from one plane and add to another, the cubic area does not change, as shown in the three distinct silhouettes below: a cross-shape (1), an I – shape (2), and a T shape (3). When folded, they are all the same size. You can design a multitude of bag shapes using these three simple grid formations. Think of these as possible slopers, or master templates, for your bag and its shape. Each pattern has 6 planes: top, bottom, front, back, and 2 sides. In bag design-speak, we call them: top, base, front, back, and 2 gussets. The visible differences are in the seaming. You can shift seams for simpler construction, ease of handling, or pure aesthetics. For instance, in the cross-shape bag style assembly, the seams are vertical in all four corners of the bag. For the I-shape bag style, the seams are one vertical one down the centre of each bag gusset and one across the gusset at the base of the bag. And for the T-shape bag style, the seams appear on the two vertical front corners and one horizontal seam along the bottom of each gusset at the base of the bag. Labour-wise, all require four passes under the sewing machine foot. Once you establish your framework, the next step is to alter it to your design speciﬁcations. When you manipulate the edges of one or more surfaces by adding, subtracting, or shaping, you transform the box into the unique design of your handbag (see post on invisible grid). For instance, you can add to the basic template as shown above to alter its shape (Note: The red lines represent the new style lines). The front and back planes of the cross-shape style (1) have more surface area by curving the sides. Due to that curved lines are longer than straight lines, additional length need to be added to each gusset so that top edges will match up when assembled. The same can be said for removing surface area. In the diagram, the basic I-shape style (2) is transformed by shaping each half-gusset inward toward the top edges, then cutting away the excess thus altering its shape. Each style represents the bag body or cavity once it is assembled. You can turn the top section into a flap; replace it with a metal frame, zipper, or draw cord; or eliminate it entirely. Also when modifying a basic template keep in mind the Rule of Thirds (see post on Rule of Three) as bag details and embellishments that appear in odd numbers are more appealing, memorable, and effective than even-numbered pairings. While it is easier to create symmetry by balancing elements in pairs, odd numbers helps shape more interesting concepts, enhances user-functionality and establishes a smarter balance. For instance, below, is an example of how the basic I-shape style is altered into 3 parts to create its gussets and creates better visual appeal to the bag style. The resulting style produces clean lines where the bag pattern folds on all sides and the bag is shaped by sewing up the gusset seamlines. The next step is to execute a draft so you can see your creation in three dimensions. You can also draw on detailing, such as pocket placement and additional seams. Be certain to ¨true¨ all matching points and lines in your draft. When designing a practical bag, keep in mind that you want a reinforced bottom, a secure top, an opening large enough for its contents, and pockets to keep everything organized. If you are always on the go and reaching for your bag, you will want handles that are long enough to throw over your shoulder, or one strap handle so you can carry the bag across your body to keep hands free. As mentioned earlier, having the proper pattern-making tools and supplies on hand is a must to get the job done. Basic pattern-making tools and supplies are easy to find. You will need paper, first of all. I use kraft paper aka parcel wrap but any type of large format paper from newsprint sheets to rolls of professional ‘dot’ graph paper will do. Next, you will need 3 basic drafting tools: a grid ruler for measuring and drawing straight lines, a set square to construct proper 45 and 90 degree angles, and a French curve to draw smooth curved lines. Choose either imperial (inches) or metric (centimeters) for your units of measure but be consistent. You cannot mix and match measuríng units. That is about all you will need to start pattern drafting, though you may want to add a tracing wheel to your kit for tracing off or copying many mirrored pattern pieces from the main pattern-draft. Paper scissors, a glue-stick, scotch tape, and sharpened pencils are office staples that you probably already have on-hand. All these tools and supplies can be purchased online or at any art supply store. With colour on the catwalk as a key indicator of the colour pathways you can expect to see showing up across all areas of design and dare we say, with unexpected colour palettes, that encourages opportunities for self-expression, you may want to check out more colour trend forecasts from the Spring 2018 Fashion Week shows for inspiration, courtesy of Pantone. Something a little different from the design studio today. Instead of talking about designing our own fashion bags I have a quick and easy tutorial about creating your own holiday gift bags. My sister and I used striped ticking and stencilled some crashcloth from her quilting classes to make our gift bags this past weekend but you can use almost anything fabric you want. Think holly jolly and ’tis the season. It was only an after-thought that I think we should have lined them as well. Live and learn, I say! My sister and I were reminiscing about how Mom would have all us kids on holiday wreath duty at this time of year when we lived on the homestead. I suppose it was her way to keep idle little hands busy and curb our enthusiasm that Santa was coming soon. There was four of us… me, my two sisters, and my baby brother who was really too young to be of any help except eating popcorn Mom made from scratch. Throughout the year, Mom collected clear dry-cleaning plastic bags and clear produce plastic bags from the grocer to be turned in feathery, shimmering holiday wreaths trimmed with pinecones and dried flowers we picked on our woodland excursions and freshly-pressed old ribbons from gifts received throughout the year. My job, being the eldest, was to cut away any printed labels from the plastic bags, then cut open the bags into a flat plastic sheets. Each flat sheet was then divided into approximately 12-inch strips. Mom, second in the assembly line, would roll the plastic sheets into a tight ‘cigar’ roll and slice 1-inch ribbons from it to create piles of feathery streamers. My sisters, whenever they weren’t grabbing handfuls of popcorn and next in the assembly chain, would tie the plastic streamers one-by-one around recycled wire clothes hangers that Mom had distorted into circular shapes. Once all the cutting had been completed, we all joined in with the popcorn-eating and double-knotting of the shimmering streamers to the wreath, packing them tightly together next to each other until you could no longer distinguish the coat hanger. I recall we were a productive team of Santa’s little helpers and made wreaths for every window and door frame in our home. Mom would trim up the scraggly bits from the wreaths to even-out the form into a fluffy feathery halo and tie on big ribbon bows and clusters of pinecones. So today I thought I’d show you how to making your own lined holiday gift bags which are quick and easy to make assembly-line-style with your children. I think children can be very creative and it is easy to harness their enthusiasm for the holidays. Most of all, it creates wonderful memories and holiday traditions. You’ll need a few supplies but as sewers and crafters you may have most of what you need covered already and it is an excellent way to tidy up your sewing room and re-purpose those odds and ends you’ve been saving or use up from your fabric stash or quilter’s fat quarters. The list is short: cotton prints for exteriors, cotton stripes and solids for interiors; colourful cloth ribbons, flat braids, cording, and twines for tying up; and handmade hang-tags from Christmas Past and ornamental finishing touches such as jolly jiggle bells, yarn snowballs (pompoms) or dried natural pinecones. Actually, anything that you have on hand! 1. From Robert Kaufman, ¨Holly Jolly¨, designer: Mary Lake-Thompson; 2. ¨Winter Church Scenic¨ by Spring Creative Products, designer: Susan Winget; 3. From Pillow & Maxfield, ¨Scarlett Poinsetta¨, designer: Michael Miller; 4. From Wilmington Prints, ¨Woodland Holiday¨, designer Lisa Audit; 5. Wilmington’s ¨Frosted Holiday Presents¨, designer: Katie Doucette; 6. From Henry Glass & Co., ¨Holiday Tradition¨, designer: Jan Shade Beach; 7. From Henry Glass & Co., ¨Holiday Homecoming Snowflake¨, designer: Jan Shade Beach; 8. From Robert Kaufman, ¨Winter Grandeur¨, designer: RK Studio; 9. ¨Holiday Homecoming Novelty Stripe¨, from Henry Glass & Co., designer: Jan Shade Beach. Every year fabric designers come out with their holiday collection prints which are colourful and festive to take much of the guesswork out of creating a theme. This year is no exception. Above are a few examples of holiday themed prints which by no means is complete. You can get about four gift bags from 1 meter of 115 cm wide cotton fabric. For the linings I prefer using stripes and solids but take a look at this year’s offerings from various fabric designers’ collections below, the patterns are wonderful. 1. From Magnolia Home Fashions, ¨Red Ticking¨; 2. From Pillow & Maxfield, ¨Curly Swirl Santa Red¨, designer: Michael Miller; 3. From Henry Glass & Co. ¨Holiday Homecoming Swirl Red¨, designer: Jan Shade Beach; 4. ‘Romantic Afternoon Flannel Dots¨by Wilmington Prints, designer: Lisa Audit; 5. ¨Frosted Holiday Ticking^from Wilmington Prints, designer: Katie Doucette; 6. ¨Gingerbread Christmas Diagonal Stripe¨by Maywood Studios, designer: Meg Hawkey; 7. from Riley Blake Designs, ¨Jingle Jangle Snowflake¨, designer: Christopher Thompson; 8. From Wilmington Prints, ¨Romantic Afternoon Flannel Plaid¨, designer: Lisa Audit; and 9. ¨Cosy Christmas Flannel Stripe¨by Riley Blake Designs, designer: Lori Holt. This particular bag design is large enough for gift-wrapping a bottle of wine, a tall stack of home-baked cookies, an assortment of mixed unshelled nuts, candy boxes, or a small toy. Once you have learned the sequence of assembly, you can use this production method to make larger gift-bags using larger quantities of fabric. Before we get started, a word about safety and ability. While I consider sewing to be a safe activity to do, it is not without risk. We are using sharp objects like scissors and dress pins, power tools like a sewing machine, and hot equipment like steam irons. It is important to respect and use these tools correctly. Assign each job to someone who understands how the equipment operates and has the ability to perform each one. The sewing skill required is basic. This project requires no pattern and only uses a straight stitch in its construction. Even a school child can sew a straight stitch on a sewing machine. Pressing with a steam iron, on the other hand, should be left to a teenager or an adult. Let tiny tots be in charge of ribbons and trimmings. They are very good at making hangtags from old greeting cards using blunt scissors and gum paste. Step 1: For each meter of fabric, fold the printed material across its width and align selvedge with selvedge and pin selvedges together. Press the fold of the material flat using a steam iron. Open the fabric face up and lay flat. Cut along the fold line to form 2 portions. With each portion (100 cm cm x 55 cm), fold the material in half along its length and align the raw top and bottom edges . Pin together and iron the fold of the material flat. Re-open the fabric face up and lay flat. Cut along the fold line to form another 2 portions. In total, there are 4 fabric portions. If the print is a directional pattern, be certain to position the fabric so that the print is pointing in the correct direction (usually it is upward). Repeat the above steps for the interior fabric. Cut 4 portions. Step 2: Join 1 exterior fabric with 1 interior fabric. (In this case, 1 print fabric with 1 solid or striped fabric). Place the exterior fabric face up with the pattern of the print in the correct direction and lay flat. Then lay the interior fabric face down on top of the exterior fabric and pin together along top edge, matching B to E and C to H.
Step 3: Machine-stitch a straight seam across the top of the fabric bundle using a 10mm seam allowance from B-E to C-H. Step 4: Press seam allowance open and flat with steam iron. Then press all the seam allowance to one side from the exterior portion to the interior portion (E-H towards B-C). Step 5: Place the fabric rectangle face up with the exterior portion at the bottom and lay flat. Measure down from the seam line on the left side 5 cm (from B-E to point X) and apply an evenly-folded piece of ribbon or twine ( 1 meter long) at point X. Baste or pin in place. Fold the fabric rectangle in half across its width matching points A to D, B-E to C-H, and F to G.
Keep ribbon ends loose within the fold. Step 6: Machine-stitch a straight seam from top to bottom (A-D to F-G) using a 10mm seam allowance to form a tube. Be certain to catch the sandwiched ribbon in the seam stitching. Press seam allowance open and flat. Step 7: Machine-stitch a straight seam across the bottom of the fabric tube using a 10mm seam allowance from F-G to fold of the fabric. Do not sew over the ribbon ties. Press seam allowance open and flat. Step 8: Align the vertical seam over the horizontal seam at point F-G to create a diagonal point. Measure from point end inward along seam line 5 cm and sew perpendicular to the seam lines. Repeat this step, this time aligning horizontal seam F-G over the foldline and sewing a perpendicular seam 5 cm from the corner point. Step 9: At the top of the tube, turn under the raw edge 10 mm and press flat. Repeat step 8 at A-D and also at the fold line, leaving the top of the tube open for turning. Step 10: Pull the bag right-side-out through the opening in the lining and match the turned edges of the opening together. Edge-stitch along opening to close up. Then drop the lining into the cavity of the gift bag and stop when the lining reaches the seam allowance of the joining seam (B-C to E-H). Here you want to ¨wrap¨ the lining over the seam allowance to form a piped effect across the top of the gift bag. The width of this effect is equal to the seam allowance, 10 mm wide. Stitch-in-the-ditch along the groove of the seam line to catch the lining in place. Your teamwork is complete. Add a hangtag and any ornaments to the ribbon ties. Endless Inspiration 3,000+ hours of premium video tutorials in more than 16 different crafts, including exclusive content only available to members. Plus, bonus recipes, guides, patterns, and more (including new videos released every week!). Expert Guidance 24/7 access to 600+ of the world’s leading experts. Ask questions and get personalized answers as you go. Creative Connection Join 13 million other makers for inspiration and support, plus ideas, tips and feedback for every creative journey. Today I want to tell you about the new direction that Craftsy is taking… unlimited access to the world’s most creative community. 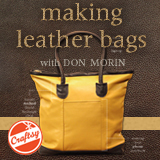 Not only will you have access to my online class, ¨MAKING LEATHER BAGS with Don Morin¨ but also all of the hundreds of instructional videos offered by Craftsy. Whether you sew, quilt, bake, paint, make jewellry, knit, snap photos, garden, weave, woodwork, draw, embroider, do papercrafts… there is so much more to experience with Craftsy. This is a new way to practice your passion and share with your family and friends. So take another look at Craftsy and see what they are offering today. Start your 14-day trial here. START TODAY – click here!